Activist groups and professors gathered Monday at the Texas Education Agency to list their concerns with a proposed Mexican American studies textbook and call on the board to reject it. If the State Board of Education approves a proposed Mexican-American studies textbook this fall, Texas students could learn that the Aztecs waged war because of “bloodlust,” 19th-century Mexican industrial laborers often drank on the job and slavery was in swift decline just before the Civil War, scholars and activists said at a press conference Monday. Activist groups and professors with the Responsible Ethnic Studies Textbook Coalition gathered Monday at the Texas Education Agency to list their concerns with the book, “Mexican American Heritage,” and call on the board to reject it. 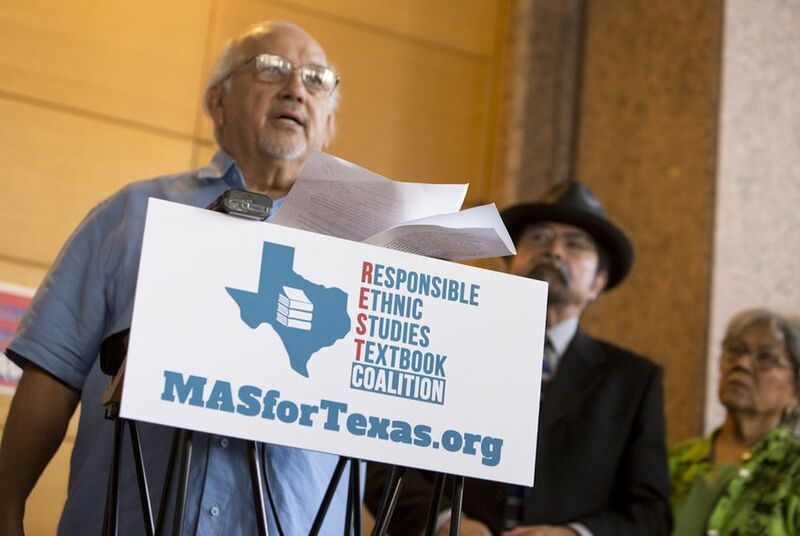 “Excessive errors render the proposed textbook useless and even counterproductive,” said Emilio Zamora, a professor of history at the University of Texas at Austin who reviewed the textbook at the request of board member Ruben Cortez, D-Brownsville. The text was the only submission the board received after it issued a call in 2015 for textbooks to be used in Mexican-American studies classes at the high school level. Roughly 10 high schools in Texas currently offer Mexican-American studies; the content of the course varies from school to school, but is often interdisciplinary and includes history, literature and current events. Activists had hoped that a state-approved textbook would make it easier for teachers to start offering the class. At the press conference, Kathy Miller, president of the Texas Freedom Network, noted that the publisher of "Mexican American Heritage," Momentum Instruction, LLC, has never published a textbook before, and one of the text’s contributors is Cynthia Dunbar, a conservative former board member. The board next meets July 19-22, but discussion of the textbook is not on its agenda. The board will hold public hearings on the book in September and vote on whether to adopt it in November. If the board approves “Mexican American Heritage,” districts will still be free to use the textbooks and other materials of their choosing. Under state law, school districts are able to select their own textbooks and instructional material as long as they can prove it aligns with the state's curriculum; however, many districts — especially smaller ones — use state-recommended materials. On Monday, Momentum Instruction, LLC did not return phone calls requesting comment. At the press conference, Zamora said he found an average of five to seven errors on each page he reviewed. He said the text focuses more on general American and world history than on the experiences of Mexican-Americans, characterizes Mexican-American social justice leaders as a threat to the United States and doesn’t cite professional scholarship in the interdisciplinary field of Mexican-American Studies. Christopher Carmona, chairman of the Committee on Mexican American Studies in Pre-K-12 at Tejas Foco, the state branch of the National Association for Chicana and Chicano Studies, said the flawed textbook reflects a broader problem in Texas: the relative paucity of Mexican-American studies courses in public schools where over half of the student body is Hispanic. Currently, about 10 high schools have established such courses through the state’s elective course “Special Topics in Social Studies,” which allows schools to develop their own classes, including ethnic studies. “The textbook is a symptom of the fact that we don’t have this in place,”said Carmona, who is also an instructor of English at the University of Texas Rio Grande Valley. The call for textbooks was issued as a compromise when the board debated ethnic studies in 2014. Cortez initially proposed establishing a full-fledged Mexican-American studies course. Instead, the board voted 11-3 to ask publishers to submit textbooks that teachers could use for courses in various ethnic studies classes. No board members attended the press conference. Last month, Cortez and State Board of Education member Marisa Perez, D-San Antonio, both spoke publicly against the textbook. On Monday, other board members reached by phone largely said they intended to wait before making a decision about which way to vote. In an interview with The Texas Tribune, board member Geraldine Miller, R-Dallas, said she had not yet read “Mexican American Heritage” but was anticipating the board would discuss it in the months ahead. Miller voted against the call for textbooks in 2014 because she was persuaded that the content of ethnic studies courses is already covered in world geography courses. “We should focus on that more than to divide everybody into their different cultures, because America is what? We’re Americans first,” Miller said. Donna Bahorich, R-Houston, chairwoman of the State Board of Education, who supported the call for textbooks, said she had not yet decided which way to vote on “Mexican American Heritage” but was looking forward to the public comment period. Board member David Bradley, R-Beaumont, said he had voted against the call for textbooks because he thinks Mexican-American studies is discriminatory against Americans of other ethnic backgrounds. He said he tentatively plans to vote to adopt the book. At the press conference, Miller said that the groups opposing the textbook, including the Texas Latino Education Coalition, ACLU of Texas, and the Mexican American Legal Defense and Educational Fund planned to attend public hearings and circulate a petition calling on the board to reject the book. Carmona said coalition members are also working on bringing proposals about ethnic studies to legislators ahead of the 2017 session. Carmona said one model is a California bill that would have required that state to develop ethnic studies curricula that schools could choose to adopt. Gov. Jerry Brown vetoed the bill. Disclosure: The University of Texas at Austin and the University of Texas Rio Grande Valley have been financial supporters of The Texas Tribune. A complete list of Tribune donors and sponsors can be viewed here.